REDWOOD CITY, Calif. and MUSCAT, Oman, July 6, 2018 /PRNewswire/ -- Equinix, Inc. (Nasdaq: EQIX), the global interconnection and data center company, and Oman Telecommunications Company (Omantel, a MSM listed company: OTEL), announced the companies have entered into a joint venture to deliver data center and interconnection services to customers in the Middle East through the development of a new network-dense data center that will be located in Barka, near Muscat, the capital of Oman. This joint venture will establish the first world-class, carrier-neutral hub in Oman where carriers, content providers and cloud providers colocate critical IT infrastructure. Oman is strategically positioned between Asia, Africa and Europe, and the new Equinix International Business Exchange™ (IBX®) data center will create a regional interconnection hub with ultra-low latencies between global business markets. Based on demand and requirements, customers in the GCC and wider MENA region can also leverage other Equinix data centers in the region for dual access to content providers, allowing carriers, content providers and cloud providers to further build resilience into their IT and network infrastructure. The new IBX data center in Oman will benefit from connectivity to strategic cable landing stations (CLS) and subsea cable systems that terminate directly inside the facility. It will also benefit from the investments by Omantel in multiple strategic subsea cable systems throughout the region and world. This subsea cable connectivity will provide customers with significant cost savings and an increase in performance and security. Under the terms of the agreement, Equinix and Omantel will both fund equity contributions in an amount of US$10 million for the joint venture representing a 50% shareholding each, and additional funds will be raised through debt financing assumed by the joint venture company. The shareholders' agreement was signed on June 20, 2018, and the joint venture company was established on June 26, 2018. Equinix will operate the new IBX data center, which will include 18,600 square feet of colocation space and approximately 750 cabinets at full build. The first phase of the three-phase build will include 250 cabinets and is expected to be completed and open for business by Q2 2019. According to the recently published document Worldwide Datacenter Installation Census and Construction Forecast, 2018–2022, IDC observes a clear trend of movement of internal data centers to service provider data centers. With more than 200 data centers worldwide, Platform Equinix™ enables customers to easily interconnect with one another in business ecosystems for maximum collaboration across digital supply chains in 52 markets globally. 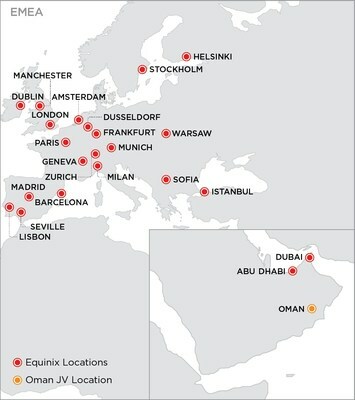 Additionally, 30 Equinix metros are close enough to the shorelines to support the CLS model. Omantel is a global communications provider with cable landings and connectivity to more than 120 cities globally. It has investments in 20 subsea cable systems and leverages six diverse landing stations in Oman and one in France. Additionally, Omantel is an investor in AAE-1 consortium, one of the largest, newest high-capacity connections between Asia, Africa and Europe. Omantel has also invested in multiple regional and international cables including Europe India Gateway (EIG), Bay of Bengal Gateway (BBG), Gulf to Africa (G2A), and Silk Route Gateway-1 (SRG-1), among others. As a result, Omantel will be able to offer a redundant and unique latency of 160ms between Frankfurt and Singapore, two of the world's main capacity hubs accessible directly from within the new IBX data center in Oman. "We are excited to work with Equinix on this project and accelerate how users experience cloud, content and next-gen communications. Today, data center infrastructure sits at the heart of global ICT and enables all of us to enjoy the cloud-based apps and services we use every day. The planned IBX data center with Equinix in Oman represents a massive step forward for Oman and the Middle Eastern ICT markets. Working on this project will allow both companies to bring together their strong assets and enable a new era of telecommunications both locally and globally. Such partnership will further enhance Oman's competitiveness in the global digital economy and trade." "We see significant potential for Oman as a market generally and, in particular, supporting CLS requirements as subsea cable momentum accelerates. It's all about meeting the growing need for interconnection – private data exchange between businesses. In the digital age, companies need to reach everywhere, interconnect everyone and integrate everything, and they need to do it out at the digital edge, where commerce, population centers and digital ecosystems meet. Our joint venture with Omantel will do exactly that." Omantel Wholesale is the international and domestic wholesale arm of Oman Telecommunications Company S.A.O.G. (Omantel), the first and leading integrated telecommunications service provider in Oman. Founded in 1970, Omantel is a joint-stock company listed in Muscat Securities Market and is 51% owned by Oman Investment Fund (OIF), a wholly owned investment arm of the Omani government. The company has laid the groundwork for telecommunications and technological advancement in the country and it continues to invest heavily within its own borders and abroad. As a result, Omantel has acquired a controlling stake in Kuwaiti Mobile Telecommunications Company (Zain Group) last year, making it the second largest shareholder in the company. Omantel Wholesale capitalizes on ultra-low latency networks to enable innovation and digital transformation globally, utilizing Oman's geographic advantage at the absolute nexus of the east, west, north, and south to enable its customers and partners to deliver their services with the best possible end-user experience. This press release contains forward-looking statements which are based on current expectations, forecasts and assumptions that involve risks and uncertainties that could cause actual results to differ materially from expectations discussed in such forward-looking statements, including statements related to the entry into this joint venture in Oman and the expected benefits from the joint venture investment. Factors that might cause such differences include, but are not limited to, unanticipated costs or difficulties relating to the integration of companies or new ventures we have acquired or will acquire into the Equinix platform; the challenges of acquiring, operating and constructing IBX data centers and developing, deploying and delivering Equinix services; a failure to receive significant revenue from customers in recently built out or acquired data centers; failure to complete any financing arrangements contemplated from time to time; competition from existing and new competitors; the ability to generate sufficient cash flow or otherwise obtain funds to repay new or outstanding indebtedness; risks associated with establishing a business in a new market for Equinix like Oman, the loss or decline in business from our key customers; and other risks described from time to time in Equinix filings with the Securities and Exchange Commission. In particular, see recent Equinix quarterly and annual reports filed with the Securities and Exchange Commission, copies of which are available upon request from Equinix. Equinix does not assume any obligation to update the forward-looking information contained in this press release.